The first to gain mention comes from Pokémon Black 2/White 2, the second pair of games in the fifth generation. This guy prevents you from visiting Driftveil City, and for that matter every other NPC as well. And he’s also a professional roadblock! To be fair, you probably could make it past him if it wasn’t for all those other people standing in the way, but apparently he’s the one responsible. He won’t let anybody past because, from what one can gather, he either failed to, or is trying to, impress a girl with his unique battling style, either Rotation or Triple battles (depending on which version you play). And apparently, you can only battle him after getting the fourth Gym badge. 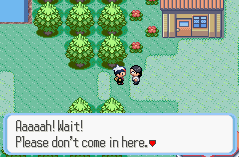 If you try and talk to him before that, he’ll claim he’s too busy battling other trainers. Whatever you say, Mr. Ace Trainer. But this is plain weird. Why is he seemingly holding everyone up like this just to battle? Why does the game make such a big deal that every NPC will remark about him, and build up this roadblock as a result? And whose heart did he break, and how? And why does he repeat that phrase so often? These are all unique screenshots. Yep, he repeats that phrase over and over. At least the games are consistent about him. Those who played the original Black and White games would possibly remember Charles the heartbreaker, as he was in Driftveil and would also mention that he… was a heartbreaker… in the exact same way. He had a bike, and did either a rotation or triple battle if you talked to him, but he was completely optional. And when you think about it, a guy blocking everyone from going on a bridge to repeat that same weird phrase is fairly odd. At least he knows when he’s beaten. 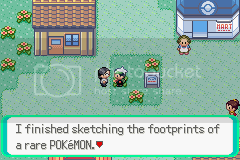 He apparently wants to sketch the footprint, and requests that you leave the area alone for a while. Sure, you could understand someone not wanting you to screw up their research. He found an interesting footprint and wants to be sure that he can identify what made it. But surely you could just step around it, or over it? Unfortunately for you, you’re unable to navigate past single tiles without him noticing, so you have to take the north route and battle your rival, and then return to see Professor Rowan. A remarkable mistake that both you, the protagonist, and him, make. Silly enough for this list at any rate! We go back to Black 2/White 2 for this roadblock, and a much more tongue-in-cheek entry for that matter. This is at a point in the game where you’ve already encountered the likes of Charles, and a handful of other NPCs that stand in front of Gyms and stop you from walking into a route before you even have a Pokémon. But what prevents you from heading south of Undella Town through Route 14, and to either Black City or White Forest? 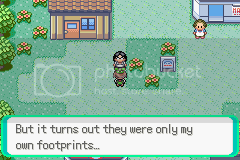 Players of Black and White would have known these were post-game areas, but seeing Undella was post-game as well, it seems like now you could enter these places before the Elite Four. They’ll all tell you that, and true to their word, they spin on the spot and will do so until you return as a Champion. At least they’re honest about their role! And hey, it’s a silly idea as well. Kudos to Game Freak for having a funny roadblock that both makes no sense, and acknowledges that fact. Unfortunately, Game Freak have also been guilty of roadblocks that are glaringly silly and don’t seem to be that way, as the X&Y games illustrated to us. Once the player gets to Lumiose City, the giant hub full of stores and cafes and a million other things, you naturally want to wander around and get yourself hopelessly lost instead of actually going and having battles. After all, you want to see this fancy new town on the 3DS, and check out the Pokémon version of the Eiffel Tower, right? 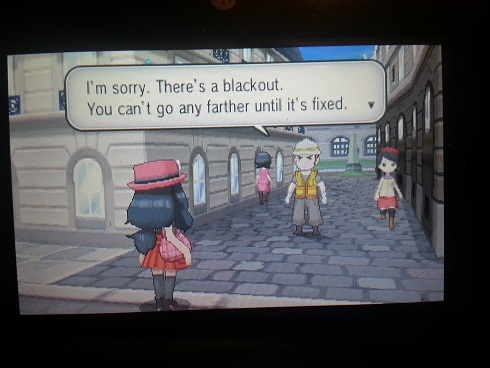 Blackouts however are apparently very unsafe, and render most of a city inaccessible as a result. This construction worker will pop up in every alleyway and road that leads to those areas, and other NPCs will comment on it as well, such as the taxi drivers. And naturally, this lasts until you get four Gym badges and have a few plot-related encounters with Team Flare as well. Only then does power come back to the city and you can explore it in its entirety. The second issue is apparent when you try to get past at night. If there is a blackout, then why are all the lights on? Evidently they just forgot, or were too lazy, to program the game so that city lights didn’t come on in these cutscenes. Blackouts that aren’t even there? That’s pretty silly. 1: Coffee, where art thou? Top of the list for me harks back to the days of the first generation, right in the first major town when you’re still a newbie trainer. 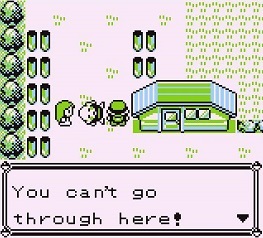 In fact, he’d count as the second roadblock in Pokémon games, sans perhaps what the little-known Pokémon Green offers up. You’re on your way to Viridian to pick up a package for Professor Oak, who is far too busy standing in his lab to walk there himself. Just in case you try and go further on though, a familiar old man will block your path, aided by a concerned NPC and a ledge. Now, I personally am not a coffee drinker, but I know a number of people that do. Some get a bit grumpy or just don’t function as well without their caffeine hit, but as far as I’m aware nobody has had withdrawal symptoms to the point of lying in the middle of the road and yelling at people it’s their private property. Silly would be putting it kindly. He’ll even offer to teach you how to catch a Pokémon now. This persisted in the remakes, but there is one thing worthy of mention of the Coffee Guy – in the Japanese versions of RBY, he’s lying in the street for an entirely different reason. Instead of not enough coffee, he’s had too much alcohol. This explains him lying in the middle of the street and yelling while other NPCs look on so much better… but of course, censorship upon the game’s release in Western society got this changed to the friendlier, yet less believable, coffee excuse. That concludes the list. There’s a host of other ones that didn’t make the cut however, from dancing pseudo-trees, to people selling candy (filled with rage) and not letting you past even if you do buy it. If there are any other NPC roadblocks you feel need a mention, offer them up in the comments! This entry was posted on Sunday, December 7th, 2014 at 9:07 am	and is filed under Articles, Top Lists. You can follow any responses to this entry through the RSS 2.0 feed. You can leave a response, or trackback from your own site.